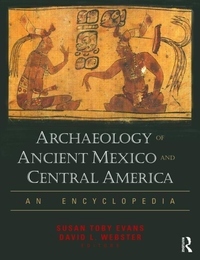 This is the first comprehensive, one-volume encyclopedia in English devoted to pre-Columbian archaeology of the Mesoamerican culture area. In more than 500 articles by the major experts in the field, this work brings the most recent scholarship to an examination of regional environments and their cultural evolution. Entries range from the familiar and world-renowned archaeological discoveries of Maya and Aztec sites to more recent excavations such as the Sayil archaeological zone in the Yucatan and Teopantecuanitlan in Guerrero. A rich historical and cultural resource on one of the world's six cradles of civilization, this reference is ideal for students, scholars, and prospective travelers.